Stock market news, interesting facts, observations, and commentary to help you navigate through the endless flow of media data. FOMO stands for "Fear Of Missing Out" - this is the rally the market experienced, and it's an odd one. This move got its start once the market started to think that we weren't going to fall into a recession. And the magnitude of the move very much reflects the kind of move we get after a real recession, not just a perceived one. 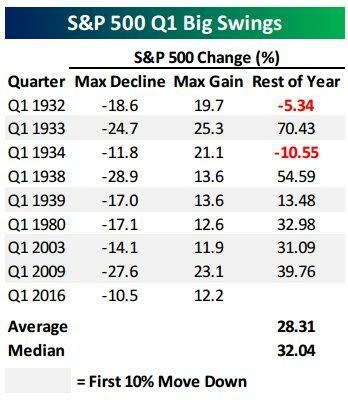 Ignoring the moves from the 1930s - I don't believe that's relevant at this stage of our development of the understanding of the economy and how markets work - we're left with 1980, 2003, and 2009 as key plot points for how the market experienced large declines in the first quarter only to be followed by a similarly massive rally. The difference today vs. back then was that there was a real recession, and profits tanked and so did stocks, but what we have today is a situation where profits really are falling, but... markets are clinging rather stubbornly to the implied support of the Federal Reserve not raising interest rates. The Yellen Call is truly worth noting here, and it's my opinion that the stock market is stretching uncomfortably far from what's warranted by the profit metrics. But I'm a practical person, and I respect the trends. I'm also of the belief that trend-following models are exacerbating the swings. Upward trends have a ferocity to them as the downtrends, and that's going to lead to a lot of headaches for asset allocation / trading models that are based on pinpoint triggers. Triggers may not be particularly timely when they get hit.